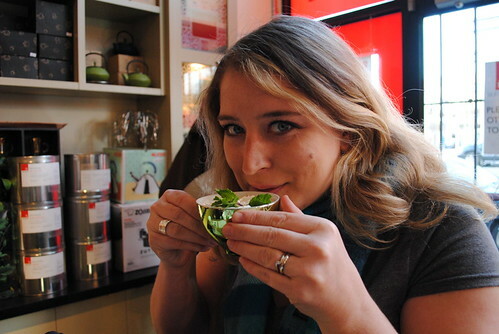 Whether we intended it or not, tea was certainly a theme of our girls’ getaway to Nanaimo and Victoria, so it seemed only fitting that Rebecca and I take some time to visit Silk Road in Victoria’s downtown core. 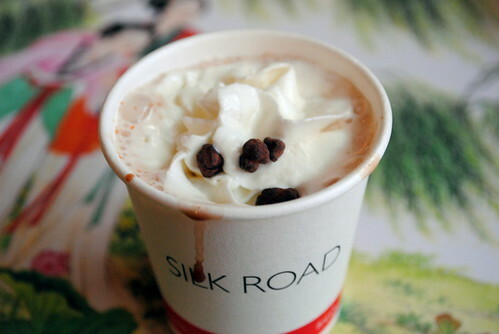 A fixture of the local culinary scene for almost two decades, Silk Road has grown into something of a local phenomenon. Since my last visit to Silk Road, the shop has grown into the breathtaking space next door, complete with a workshop bar, expansive wall space for all of the teas, trinkets and teapots as well as ample room for their nurturing spa products created entirely on site. 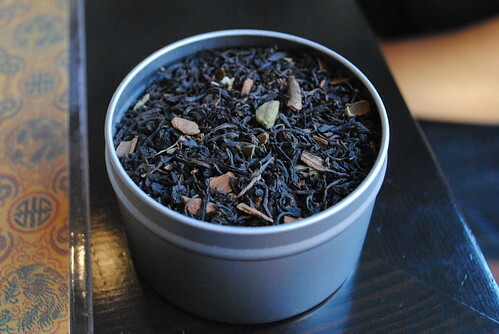 Created by two women who are both Chinese Tea Masters and Herbalists, Silk Road honours the centuries-old tradition of tea preparation and drinking. 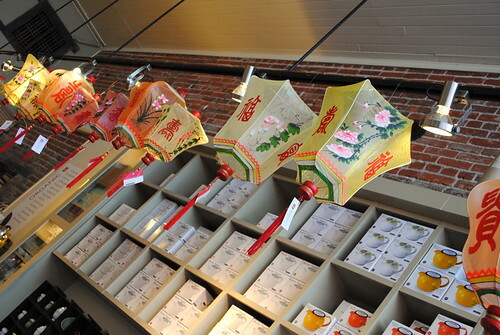 Each and every blend that lines the walls of this Chinatown treasure is unique to Silk Road with organic ingredients being especially chosen from all over Asia before being hand-blended in Victoria. 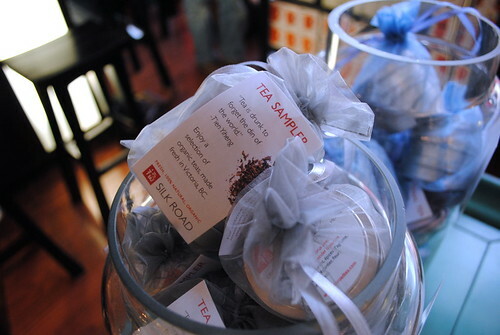 In addition to tea blends, Silk Road has also become increasingly famous for their aromatherapy and spa products. Using essential oils and only the purest of ingredients, the shop offers a complete line of body and skin care. These products are used extensively throughout Silk Road’s spa. Being that we visited Silk Road on a Saturday afternoon, Rebecca and I were fortunate enough to partake in one of their popular tea tasting workshops. 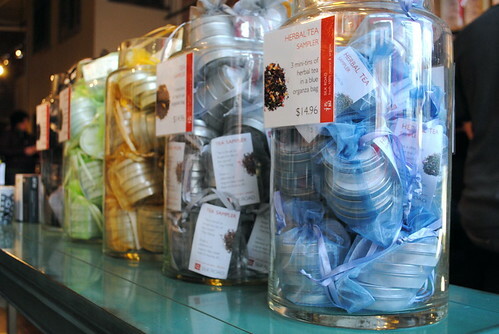 Think of it as a wine tasting but for tea buffs. 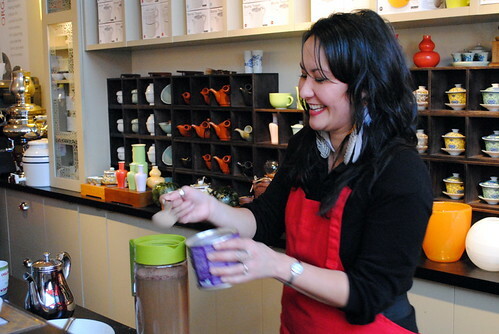 Not only were we able to sample a number of the shop’s best selling teas, we – along with the 10 other participants – learned how to festively blend teas with hot chocolate. 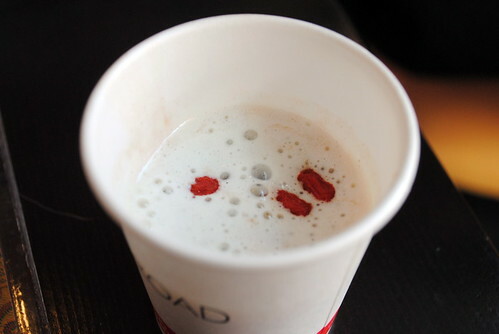 Mixing the Westcoast Peppermint with milk cocoa was undoubtedly my favourite. Further, the workshop also proved to be interesting and informative. We were explained the differences between white, green, black and herbals teas, some of the health benefits of each and even the importance of varied steeping times. 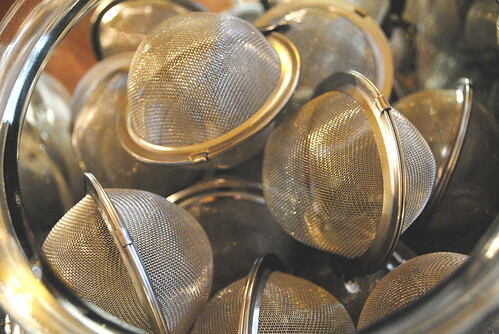 Brewing an exceptional pot of tea is truly a time-honoured art and a tradition to be respected. 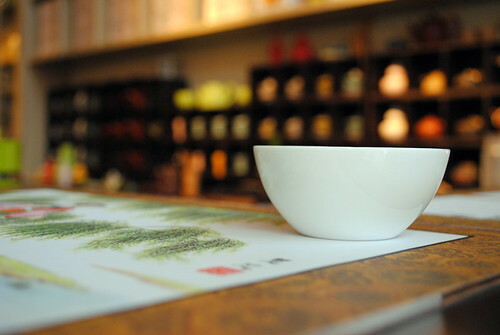 Silk Road’s tea tasting workshops at the Tea Tasting Bar are held each Saturday and Sunday at 2 p.m. from now until the end of June. 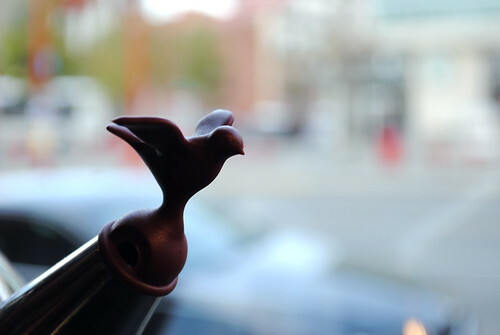 For more photos and fun from our Silk Road visit, please head over to Miss604.com and read Rebecca’s post. 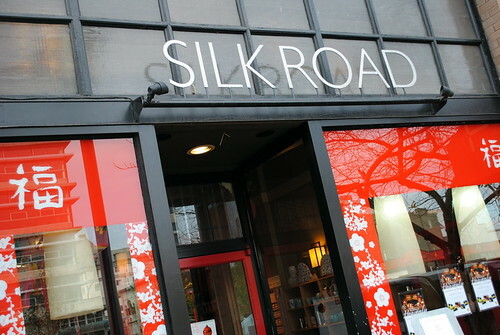 Silk Road is located at 1624 Government Street (between Fisgard and Pandora Streets) in downtown Victoria. They are open Monday through Saturday from 10 a.m. – 6 p.m. and Sundays from 11 a.m. – 5 p.m. During the holidays, Silk Road is open for extended shopping hours, so please phone ahead at (250) 704-2688 (press 2) or visit their website to find more information. You can also find Silk Road on Facebook or follow their updates on Twitter. Do you have a Vancouver Island-based business you’d like to see profiled on Island Profile? Please contact Keira-Anne directly. I remember our visit to Silk Road on our getaway a few years ago…the variety was amazing! I can’t believe I’ve never been there. Will have to check it out next time I’m in Victoria with the girls. I absolutely love the pictures you add to all your posts. These ones truly give me a sense of what it must be like being there, and certainly make me want to go! Glad I read your blog..oh my I have to get to Silk Road before the holidays! Thanks for visiting Silk Road! We’re glad you had a good time & we look forward to having you stop by again. p.s. 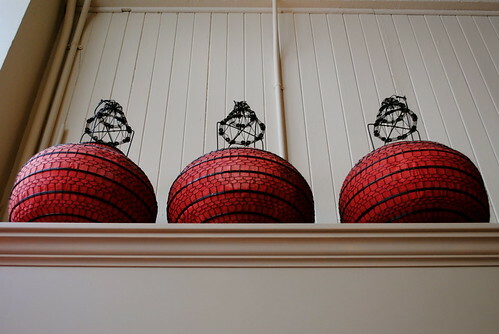 Keep up the great work with your blog – you keep us “in the know” about cool things to see and do!